Kevin Levin got the jump on me 🙂 but it’s o.k…. hat-tip to him (see Kevin’s post it here) about the story of Amos McKinney (1st Alabama Cavalry, USA) receiving a headstone recognizing his service. April 19, 1864 – Operations against Unionists in Marion County, Ala.
Tuscaloosa, Ala., April 27, 1864. CAPTAIN: I have the honor to report to Brigadier-General Armstrong, commanding division, that in obedience to orders from General Jackson I left Tuscaloosa on the morning of the 19th instant in command of detachments from the Sixth and Ninth Texas Cavalry Regiments (commanded by Lieutenant-Colonel Ross and Major Bates, respectively), and Captain Lee’s squadron, from the Third Texas Cavalry, amounting in all to about 300 men. I proceeded according to instructions to operate against the tories, who were reported to be in open resistance in Marion County, Ala. On the route a small party of my men were fired into by a party of men dressed in Federal uniform. The tories immediately fled and were hotly pursued, but getting into the hills they made their escape. I learned on my return that one of these men was a captain in the Federal army, and down there on recruiting service. The others were tories belonging to the Yankee army and at home on furlough. When I reached Marion County I found that the reports in regard to the tories had been greatly exaggerated, and that there were none of them in open resistance. There are a great many deserters there in the woods and a good many of them are armed, and I learned that secret organizations existed among them, but saw no evidence of an open resistance. 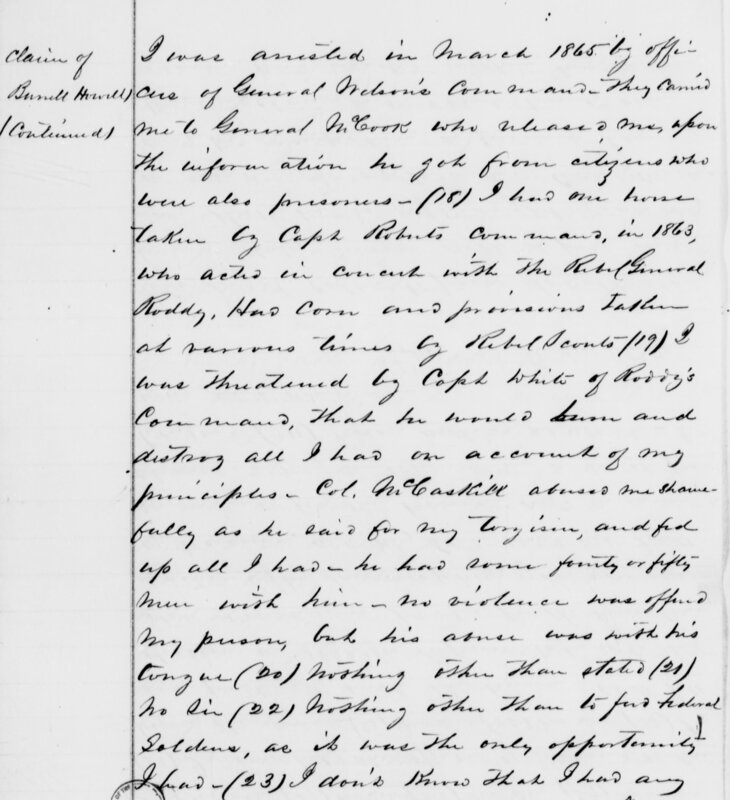 In regard to the case of Captain Woodward, which I was ordered to investigate, I found the captain with an order to recruit and organize a battalion, given him by Colonel Patterson, commanding a brigade in General Roddey’s command, and a letter of instructions from the same, which I herewith transmit. Deeming his authority insufficient, I brought Captain Woodward and all of the men that he had with him in with me. Finding that I could not longer remain in Marion County, owing to the great scarcity of forage, after remaining two days I determined to report with my command at Tuscaloosa. I captured a good many conscripts and deserters, and succeeded in reaching this place with about 50 men whom I found absent from their commands without proper authority. Comdg. Detachment Texas Brig., Jackson’s Cav. Div. Check-out Civil War Florida’s four posts about some of Florida’s (and some of Alabama’s) Union soldiers from the 1st & 2nd Florida Cavalry… Pt. 1, Pt. 2, Pt. 3., & Pt. 4. Looks like more posts are forthcoming! Shhhhhhhhhhhhh! Let’s not talk about this . . . The following post is actually a re-post (having originally appeared on August 27, 2007) from Hill Country of Monroe County, Mississippi: A Weblog by Terry Thornton. I’m thrilled to be able to post it here again, with Terry’s permission. It’s an absolutely wonderful piece of Civil War “memory” and it fits extremely well within the environment of this blog. Note that this piece is copyright protected and used only with permission. Thanks again Terry! I am a Mississippian by birth and I am a Mississippian by choice. Of the forty-seven years that have passed since I turned twenty-one years of age, I have spent the majority living in other states electing to return to inside the Magnolia Curtain to live out my retirement. Growing up in the Hill Country of eastern Monroe County during those peaceful decades prior to the turbulent 1960s, I learned some about our region’s history and heritage but little about my Thornton family history. My father was somewhat distant to his larger family both in temperament and in geography — that, combined with the Thornton tendency to withhold information mitigated against my learning much about my ancestors. I got most of my information from overhearing snatches and snippets of conversations while listening from the chimney corner. And as I grew older I learned that perhaps not all of the solid Southern unity was as it was rumored and taught to be — that perhaps there were cracks in the solidarity in the Hill Country Confederate unity during that difficult time some seventy-eight years before I was born. Some things didn’t add up. The older kids taught us how to play the game; they had been taught the game from the generation just older than them; and they in turn probably heard the stories from those who lived the experience upon which we had made a game. To play the game, one had to hide from the CSA draft enforcers. The place to hide was a special room underground at the cemetery in a specific family plot which had a false grave built for the purpose of hiding out. When the enforcers were in the area, you had to hide in the grave; when the enforcers were not close by, you had to hide in the dense woods and creek bottom just to the south of the cemetery. When I was a child playing there, the family plot had been modified; the false grave had been used for an actual burial. So when we hid in the special “room” we just lay between the graves crowded into that family burial plot with its interesting stones and low fencing all around. If the enforcers came and stayed a few days, the ones hidden in the grave were nourished by “grieving” mothers, sisters, or girlfriends who would come to the graveyard with baskets of flowers which contained food and water. And as the grieving females knelt there “praying” they were really whispering the latest news to those hidden just below. I could never decide which role I enjoyed playing best: enforcer on horseback charging up and dragging folks off to fight or dodger lying there in the cemetery while all the pretty girls brought me food, water, and flowers and whispered directions to me as I rested in the perfect pacifist position. To play “draft dodger” when I was a child involved a large cast of characters. There were roles for everyone no matter who all came to play that day — and we played the game often. But as I grew older, I listened to my teachers who were of the opinion that all true Southerners were loyal and 100% committed to fighting the Yankees! If that were the case, I thought, then why were there hidden rooms in the graveyard at Parham? Maybe I had it mixed up; maybe those hidden men were really good brave loyal Southerners hiding from the Yankees. Again came the, “Shhhhhhhhh. Let’s not talk about this” from the adults in my life. But the older kids checked the story out with the older ones who would tell us the straight of it — the ones hiding were hiding from the Southern draft enforcers. Then I overheard a conversation between my father and one of his relatives. What? Some of the Thorntons were in the Union Army? Whoa! I thought. How did that happen? And no one would talk to me about the event or even acknowledge what I had overheard. As I got older I also questioned why the given name Sherman was widely used in my family: my grandfather had Sherman as one of his given names; my father had Sherman as one of his given names; my brothers has Sherman as one of his given names; and I have at least two cousins with Sherman as one of their given names. Somehow this choice of given name didn’t square with my conception of the turmoil that ripped through the Hills of Alabama and Mississippi some seventy-five years before I was born. General Sherman was not one of my favorite people — he was not presented in any favorable light in any of the lessons in history I had at Hatley School. So what was I doing in a family with so many males named for Sherman? Oh well, I was told, they are named for someone else but that someone was never identified. About 1970, my father asked my wife and me to go with him to Lann Cemetery, Splunge, Monroe County, Mississippi, to visit the grave of James Monroe Thornton. James Monroe Thornton was my father’s grandfather — James Monroe Thornton was the one who first named a son with the moniker “Sherman” — in 1865 he named a son John Sherman Thornton. And while at the cemetery, my father told my wife what he had never told me: James Monroe Thornton served in the Union Army. Basically all he would or could tell me was that his grandfather, he had been told, was on the staff with General Sherman, had attained the rank of Lieutenant Colonel, and so admired the General that he vowed to name the first of his sons born after the war for the general. James Monroe Thornton survived the war and when the first child born after the war was a son, he named him John Sherman Thornton. Be damned if I would listen to another “Shhhhhhhh. Let’s not talk about this” again! Suddenly the region known as “Freedom Hills,” a rugged area that spreads across the hill country of Alabama and west into Mississippi took on a new meaning. Freedom! . . . no “Shhhhhhhhhh, let’s not talk about this” was going to stop me now. So obviously the opposition to serving in the Confederate cause was as far west as the Hill Country in Monroe County, Mississippi, if hide-outs and resisting the draft were so commonplace that children’s games were organized and played almost 100 years after those sad events unfolded. But learning more information from my father or from his larger family of their time in Alabama and of the Union Army connection to General Sherman was not to be. My father died a few years after telling me about his grandfather; the other older family members either didn’t know the family history or were not willing to talk about it. Some were of the opinion that we should not talk about the possibility of such an involvement! And there I was, blocked in with “Shhhhhhh, let’s not talk about this” from cousins far and wide. But upon probing deeper, it was obvious that my cousins knew less than I about this part of our family’s history. The “Shhhhh, let’s not talk about this” mentality had prevented some of the most basic of family information from filtering down. Several years went by and I began an email correspondence with a cousin, Lori Thornton, who was an experienced genealogist and computer expert. Lori and I compared notes and within a few months, I had the first documented evidence that my great-grandfather [and Lori’s great-great-grandfather] James Monroe Thornton had indeed served in the First Alabama Cavalry USA. Thornton, James M., Pvt., Co. A, age 38, EN 3/23/63 & MI 3/24/63, Glendale, MS, on daily duty as teamster, MO 12/22/63, Memphis, TN. James Monroe Thornton enlisted in the First Alabama Cavalry USA at Glendale, Mississippi on March 23, 1863. The next day he was mustered into service. He was assigned to Company A; he was given the rank of Private. He was 38 years old. He served daily duty as a teamster and was mustered out of service just before Christmas, December 22, 1863, in Memphis, Tennessee. My father had been misinformed about James Monroe Thornton’s rank — there had been some huge and grand promotions for Private Thornton to have attained the lofty status of Lieutenant Colonel — whether that embellishment in rank was done by James Monroe Thornton himself (he lived to the ripe old age of 88 years) or by others is unknown. Lori and I ordered the service record and the pension file for our common ancestor — and there learned for the first time the extent of his military service. James Monroe Thornton indeed was in the First Alabama Cavalry USA; he was a Private. He was at home in Alabama hiding out from the Confederate enforcers most of the time he spent in the service of the Union. He accompanied a small group in June who was returned to Walker and Fayette County and while there became ill. His family hid him in the woods from July through early December when he returned to camp. James Monroe Thornton was absent with leave from June 29, 1863 through about December 13, 1863 when he returned to duty just in time to be mustered out on December 22, 1863. He was not, however, a Lieutenant Colonel nor was he an aide-de-camp to General Sherman! He drove a team of mules or horses and hauled materials with a wagon as a Private doing teamster duty. In all of this research, however, the harsh reality of what happened to my Thornton family in the Hills of Alabama has been slowly uncovered. Lori and I are continuing to examine records that are telling us the painful story of our family — a story that heretofore had been so suppressed within the family that our generation had no clue to its reality. Here is a brief summary of some of the major discoveries. Two of James Monroe Thornton’s brothers also served in the First Alabama Calvary USA. Those two brothers died in service. No one in my family of my generation had any knowledge of these men. As far as I know, their names were not known as family. The grave of one has been located at the Nashville National Cemetery where I conducted a memorial on the occasion of the 140th anniversary of his death. It is believed that the first time that any of this young man’s family visited his grave site was 140 years after his death. The “Shhhhhhh. Let’s not talk about this” time was over. A third brother may have been killed by Confederate enforcers as he was making his way to the Union lines to volunteer. Lori and I are still working on this possibility. We know that a third brother disappears from all records during the Civil War years and we are intrigued by a statement recently discovered in his mother’s federal pension file about this possibility. More work is needed. And perhaps the saddest chapter in all of this that was never talked about in my family is evidence that three of James Monroe Thornton’s brothers also served in the Confederate Army. One was captured in battle in Kentucky and eventually exchanged/released in Mississippi. We think he returned straight to North Alabama, visited briefly with his wife and child and other family nearby, and then with his older brother, James Monroe Thornton, walked over to Glendale, Mississippi and enrolled together. James Monroe survived; the brother he enlisted with died. The youngest brother in that large family also died in the service of the Union Army. He and another brother had enrolled in the Confederate Army and both are listed as deserting at Tuscaloosa. The younger brother shows up on the First Alabama Cavalry USA enlistment rosters a month later; the other brother disappears from the records. It is presumed that he is the one his mother later states was killed by enforcers while making his way to the Union line. So I can’t tell you about a great-grandfather who was a Lieutenant Colonel in General Sherman’s army — but I can talk a bit about his service as a Private, as a teamster, during a few short months during the Civil War. I can tell you a bit about the history of the South and can confirm that the solidarity and Confederate unity wasn’t what we’ve been taught in the public schools of Mississippi. How many folks actually realize how many “galvanized Yankees” there really were? They’re a fascinating bunch of people, really. Up until a few years ago, I didn’t really think a great deal about them. I might see one here or there while combing through Confederate service records, but I never got up the energy to really investigate until about four years ago. It’s a tough bunch of guys to figure out in terms of loyalties. How many, for example, signed-on to the United States Volunteers simply because they felt their odds far better than stuck in a prisoner-of-war camp and how many signed-on because their loyalties were really with the U.S. to begin with? Then, on top of this, when we realize that a “galvanized Yankee” received a pension, does it mean that he REALLY was a Unionist? Think about it. On one hand, you have someone who has to go through a lot of hoops to get a pension for his service in the Union army. To satisfy a very discriminating pension board, the former Confederate soldier had to prove to the board that his service was really involuntary. If one could not show that they did not “bear arms against the United States voluntarily,” the pension application was going to be rejected. On the other hand, if someone was hard-up for some money, “swallowing the dog” one more time to get some cash to help make ends meet wasn’t all that bad. Like I said, they are a hard group to get your thoughts around when trying to get a grip on wartime sentiments/loyalties, but a fascinating group nonetheless. (Incidentally, this is a good online piece by Michèle T. Butts about how “Galvanized Yankees” came to be). On that note… looking for a quick distraction from thesis work late Monday night, I slipped over into my Footnote.com account and started doing a few searches. Looking back through my wife’s family tree, I remembered that she had an ancestor who “joined the U.S. service” after just over two years of service in gray… and quite honestly… surprise, surprise… he was from an area in Alabama that just happened to have some differences in sentiment. Hiram Fikes was born February 15, 1827 in Lexington, South Carolina, a son of John Fikes. A farmer by occupation, he didn’t enlist for the first time until April 10, 1862 (this was, by the way, around the time the first Confederate conscription act was being enforced; although there is nothing to show one way or the other how/if this impacted Fikes’ enlistment/enrollment), and when he did enlist it was only in a 90-day unit; the 4th Alabama Volunteer Militia (Byrd’s Regiment), Captain John Moore’s Company. He was sick-in-quarters 6/25/62 and had no further record with the unit. Nonetheless, he pops up again on the rolls of Co. H, 40th Alabama having enlisted (or having been “enrolled”) in Perry Co., Alabama (that is where he resided at the opening of the war) in March 1863. There is some confusion as to how the regiment was employed around the time of his service; one part detailed for service in Georgia, while the other part was in Vicksburg. It looks like Hiram was in the Vicksburg detachment for it is there that he was captured by the 15th Corps and was paroled on 7/9/63. Returning to service, once again, he was with the 40th Alabama again when he was captured at Big Shanty, Ga. on 6/15/64. This time the Federals didn’t mess around, and he was sent to Rock Island, Illinois by way of Louisville, Ky. In four months, he was released on oath, having signed-on with Co. I, 3rd United States Volunteers. Looking at his service cards for this unit, it appears that Hiram was an average looking fellow, with blue eyes, dark hair, light complexion, and 5’6″. He was mustered-in on October 31, 1864, and… this part always interests me (former Confederates being credited to areas to satisfy enrollment numbers)… he was credited as a recruit to Elk, Clarion County, Pennsylvania. The 3rd USV more or less hung out at Rock Island for sometime before being sent out to the Dakota Territory in 1865. While there, it appears, at least from his service records, that his service went without incident. In May 1865, he was listed as on daily duty as the company cook (hard-pressed, I’m sure, as a Southerner on duty in the Dakota Territory finding foodstuff that would be satisfying to a Southerner!). He was detached at the Sweet Water detachment on June 4. Soon after this (July 1865), fourteen men from Co. I got into a scrape with the Sioux and Cheyenne heading east to Fort Laramie, but I have no idea if Fikes was among the fourteen men (my guess is that he wasn’t). Other than the detached service at the Sweet Water detachment, there really isn’t a great deal to note from his service records until he was mustered-out at Ft. Leavenworth, Kansas on November 29, 1865 (although he did have a stoppage of pay for damaging the property of another member of the unit… don’t ask, I have no idea what that was all about). He headed back to Mississippi and there, rejoined his wife Polly and their children. He applied for a pension (oh now, hold on a second… a pension for his service in the Union, not the Confederate army) on August 18, 1892 (application #1126.495) under “Law J” and received one (certificate #1069.626). He died on October 20, 1903 in Fulton, Itawamba County, Mississippi and was buried in the Harden Chapel Cemetery. His wife applied for a widow’s pension (app. #797.144) on December 31, 1903, and received one (cert. #744.318). She died on February 20, 1925. I don’t see him as a disaffected Confederate, but perhaps a disillusioned Confederate. Likewise, he probably wasn’t a Southern Unionist in the extreme sense, but maybe he was a conditional Unionist who opted for the Confederacy initially. Yet, as he saw the writing on the wall, especially as a POW, maybe, at heart, he was just a realistic self-preservationist, looking at things in terms of his own best interests and that of his wife and children who were back in Alabama when all of these decisions were made. It’s clear that I need to look into the pension record and see what the testimonials have to say about his “loyalties” and how he got around the “not having borne arms voluntarily against the United States” thing. While some folks have done some work compiling stories about war crimes against Southerners, too often they seem to convey only the stories of those who were subjected to the hard hand of war as delivered by the Union army. As I mentioned in a post in Cenantua’s Blog about a year ago, I saw an announcement about the release of the book, War Crimes Against Southern Civilians, and, knowing what I do about Southern Unionists, found it interesting that the scope of the book was so limited. As I mentioned in that post, I can’t but help wonder when the second volume is coming – War Crimes Against Southern Civilians, the Other Side of the Story (or War Crimes Committed by Southerners Against Southern Civilians). If recommendations for stories are accepted, for starters, I’d like to suggest this story about Henry Tucker (*NOTE – This story is NOT RECOMMENDED for children as it is very graphic in detail). The story is originally sourced to Tories of the Hills, a book published in 1953 by Wesley Sylvester Thompson. Of course, there are other stories that can also be found within the pages of this blog… and there are more to come. In the meantime, continue to browse through other interesting stories in the rosters of the 1st Alabama Cavalry, USV. After exchanging a couple of e-mails with a friend last night, I mentioned a genealogical website that I thought looked like it had potential. I gave the trial version of Footnote a try about a month or so ago, but it seemed to have slow response time (it may have had something to do with my being on dial-up!). However, after sending the e-mail to my friend, I thought it might be a good time to revisit the site and do a little navigation. I knew that Footnote was putting images of Southern Loyalist Claims on the site, but I really had not taken the time to look at them. This wasn’t the first time I have seen the claims as I spent a couple of days, about two years ago, transcribing information from the claims from Page County. However, with the word “free” attached to the claims records last night, I couldn’t resist the chance to look again. Instead of looking into Virginia records, I probed the records for Kentucky, Maryland and West Virginia, in search of family members. Finding nothing listed under them (looks like some of them didn’t apply), I gave a shot with a branch of my wife’s family, which was from Marion County, Alabama. As I started scrolling through the list of names, one struck me as being familiar… Burrell Howell. Looking back in my family tree program, I found that Howell was indeed connected, in fact, he was my wife’s fourth great grandfather. Howell also had a plantation and was a slaveholder (though, according to the 1850 Marion County census, he only had one slave). I had information that showed that two of Howell’s sons served in Co. K, 5th Alabama Cavalry (serving under, among others, Forrest and Wheeler). Military records showed that these men enlisted – there was no evidence in the records of having been conscripted or deserting. So, to the unsuspecting eye (as my eyes used to be) they might be considered pretty stout supporters of the Confederacy. The claim of Burrell Howell said otherwise. According to Howell, his sons HAD been conscripted, and at some point, when they were both sick in Tennessee, he made the trip across the state line and brought his boys home, apparently having convinced the authorities that they were going home to recover. But according to Howell and others who added testimony to the claim, the boys did not return. Ultimately, Howell was proven as a Unionist and his application was approved. Now I realize that this was just one man and his two sons, but what strikes me is that most of my wife’s ancestors from Marion County served in the 5th Alabama Cavalry. Burrell Howell was the family member with an application to the Southern Claims Commission, but, considering that his sons were conscripted and yet were shown on the records as having “enlisted,” it makes me wonder how many others were taken into the 5th Alabama Cavalry (and the entire Confederate army, for that matter) as unwilling participants (also, I can’t help it, but it frustrates me knowing that some people, in this day and age, look at the military records “as is” and automatically think that their ancestor eagerly volunteered for service in the Confederate army. There is a need to dig deeper, otherwise the person “honoring” his or her Confederate ancestor does so with ignorance and under an illusion, thereby making the Lost Cause Myth even more of a myth). On another note, Marion County, Alabama holds some interesting stories when it comes to the Civil War, after all, there were several men from the county who volunteered not in the service of the Confederacy, but for the Union, and served in the 1st Alabama (Union) Cavalry. There is a good post over at TOCWOC by Fred Ray about his ancestor, S.F. Ray. Check out Soldiers, Deserters, and Turncoats. My great, great grandfather, Absalom L. Duggan (1812 – 1862) and his wife, Susannah Sanders (1814 – 1875), and their family came to Marion Co. AL from East Tenn. in 1850. They were accompanied by the families of Clemmons and Caroline Sanders; Rachel Peoples; and John M. and Clarissa Cantrell. They lived in the Pikesville area of Marion Co. These families were strongly pro-Union, and the Duggan, Sanders, and Peoples families were forced to flee as refugees to Illinois. In the fall of 1862, Absalom Duggan and Clemmons Sanders had to flee to avoid being killed, and they ultimately died of disease in December 1862 in southern Illinois. Absalom Duggan’s eldest son, Richard S. Duggan (1836 – 1863), served in Co. C of the First Ala. Cav., as did William L. Peoples and Francis M. Peoples, sons of Rachel Peoples. Richard Duggan died in 1863 while in the First Ala. Cav. In the spring of 1863, Susannah Sanders Duggan and her family were given 20 days to leave the South or be killed. In April of that year, accompanied by the families of Clemmons Sanders and Rachel Peoples, they fled to Marion Co. Illinois where they along with many other refugees (mostly widows and children) were destitute. Story courtesy of Richard Dugan.